As we move towards the ONZ Championships at Easter, March has been a relatively busy month, not only with the start of many of the regional OY Series, but also a HP camp in Rotorua, the Otago Champs and, at the end of the month, the first set of JWOC Trials. Outside orienteering there has been the usual strong showing of orienteers at Godzone, and a smattering of results from the overseas based athletes as they too look towards the international season. Two weeks before the JWOC Trials/NOL Round 2 in Auckland a group of 20 descended on Rotorua for a weekend training camp. Most came from down from Auckland but there were also attendees from Christchurch and Hawkes Bay, and although may were JWOC trialists looking for that extra little edge there was also a smattering of the elites who will be vying for places at WOC in Norway. Training kicked off on Saturday morning in the Redwoods and adjacent Scion tree park with an exercise emphasising running straight and the need to identify features both on the line and to the side. This was relatively easy in the tree park but became much harder in the denser vegetation and lower visibility of the Redwoods, particularly with parts of the map blanked out. A second exercise then took this a step further by removing all the tracks and forcing navigation on the contours. Not easy with the added presence of the tourist crowds both on the ground and in the air on the “tree top walk”. After a suitable break we adjourned to Toi Ohomai Institute of Technology for an afternoon of sprint training. The main feature here, after a short warm-up around adjacent Centennial Park, was the head-to-head racing provided by Gene Beveridge’s 2 person sprint relay – each team member running two legs. With 10 teams and a just over 1kmfor each leg this was a true test of navigation at speed, especially with 4 closely spaced splits on many of the controls requiring rapid and accurate map reading to go with the leg speed. The more sedate sprint intervals which followed were light relief. After an evening during which different groups visited a variety of thermal pools, including a relatively large expedition to Kerosene Creek and it’s hot waterfall, training reconvened on Sunday at Okere Falls. For nearly all this was the first time on this rugged area of hills, streams, cliffs and native bush which provides a real challenge even with the full map. However, to encourage accurate contour interpretation and promote route choice decision making, the first exercise left off much of the ancillary information such as vegetation, fences and tracks. Running in pairs the general idea was to discuss and test out different route choice options. Those still standing finished the weekend with a series of O-intervals bringing in a variety of techniques. Thanks must go to Orienteering Bay of Plenty, and Erin Roberts in particular, for allowing us to use their maps and helping with the organization. The next weekend camp is planned for the weekend of 18/19 May in Auckland. Sandwiched between the Rotorua training Camp and the JWOC Trials/NOL Round 2 was the Otago Champs held in Middlemarch. This saw a strong field in M21E including many who had, more or less literally, just finished Godzone (see below). Victory went to the ageless Chris Forne, while in a slightly smaller W21E field Sara prince came out on top. M21E: 1. Chris Forne (PP) 1:00:26, 2. Alistair Richardson (DN) 1:02:43, 3. Matt Scott (PP) 1:05:11. W21E: 1. Sara Prince (PP) 1:09:28, 2. Marisol Hunter (PP) 1:17:24, 3. Briana Steven (PP) 1:22:29. The first round of JWOC Trials, incorporating the second round of the National O League took place on the last weekend of March. Saturday saw a sprint on The Kings College/Otahuhu College area used for the ONZ sprint Champs in 2015, followed by a long distance on Rototoa, first used for the Oceania Champs in 2017. The fields for the trials were huge with 23 men and 19 women lining up. In the sprint M20 and W20 saw wins for Joseph Lynch and Penelope Salmon, although Kurtis Shuker pushed Joseph hard and held a 1 second lead with only 3 of the 25 controls to go. Behind Kurtis there was a gap of about 40 seconds back to Liam Thompson in 3rd place, who himself shaded Will Tidswell by only 1 second, with Will ruing 26 seconds dropped at the compulsory crossing between the two schools. Penelope, despite being highly ranked in athletics was a surprise winner in W20, holding out Tessa Burns by 18 seconds but being over a minute ahead of anyone else. With Kaia Joergensen in 3rd, Jessica Sewell 4th, and Sylvie Frater 5th all of the top 5 were from the younger end of the field and would be available for JWOC2022 on home territory should NZL be awarded it. Kaia Joergensen and Sylvie Frater leave the last control in the sprint trial. M20: 1. Joseph Lynch (PP) 15:38, 2. Kurtis Shuker (CM) 15:46, 3. Liam Thompson (AK) 16:24, 4. Will Tidswell (HB) 16:25, 5. Daniel Monckton (NW) 16:27, 6. Max Griffiths (NW) 16:39, 7. Ronan Lee (HB) 16:42, 8. Patrick Hayes (AK) 16:54, 9. Connor Cleary (PP) 17:01, 10. Stephen Harding (PP) 17:02. W20: 1. Penelope Salmon (NW) 15:19, 2. Tessa Burns (HB) 15:37, 3. Kaia Joergensen (PP) 16:22, 4. Jessica Sewell (NW) 16:49, 5. Sylvie Frater (NW) 17:24, 6=. Katie Cory-Wright (PP) 17:28, 6=. Briana Steven (PP) 17:28, 8. Georgia Skelton (CM) 17:35, 9. Cara Bradding (NW) 17:40, 10. Juliet Frater (NW) 17:57. Despite the hot competition in the trials the seniors running the NOL Round 2, and starting after the trialists, showed that even the top juniors have time to make up. The first 4 finishers in M21 were all faster than Joseph Lynch, even allowing for relatively big mistakes made by both Tommy Hayes, who had the fastest time, and Gene Beveridge. In W21 Imogene Scott absolutely destroyed the rest of the field being the only athlete to go under 15 minutes on the day. M21: 1. Tommy Hayes (AK) 15:15, 2=. Cameron Tier (NW) 15:17, 2=. Cameron de L’isle (NW) 15:17, 4. Gene Beveridge (NW) 15:34, 5. Jonty Oram (AK) 17:56. W21: 1. Imogene Scott (NW) 14:49, 2. Lara Molloy (WN) 16:43, 3. Renee Beveridge (NW) 17:00, 4. Alice Tilley (NW) 17:15, 5. Heidi Stolberger (NW) 17:28. Thanks to Counties Manakau and John Robinson in particular for putting on this event. 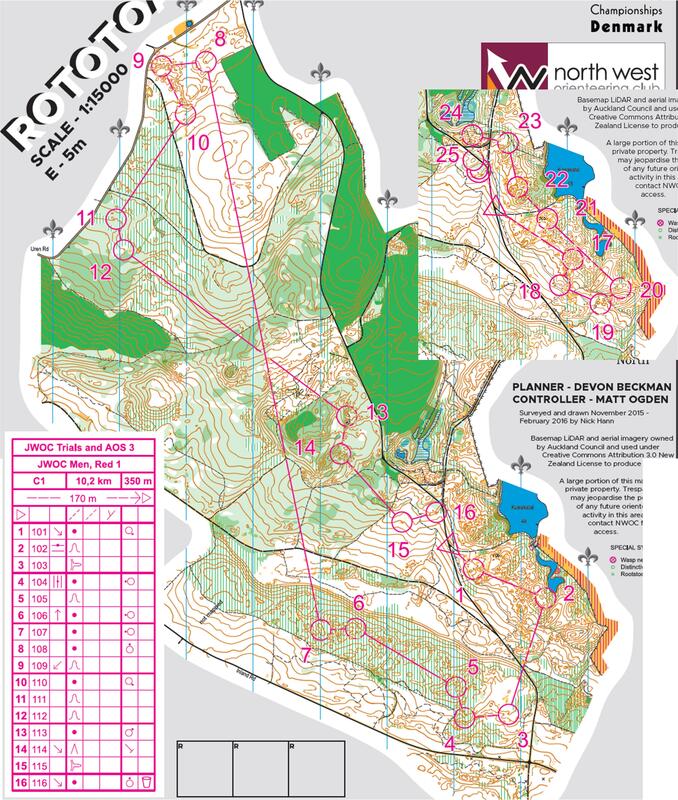 Sunday’s courses on Rototoa, planned by Devon Beckman, presented a tough challenge with significant climb, areas of low visibility, and generally rough underfoot – much more like a typical JWOC long distance course than we usually see in New Zealand. 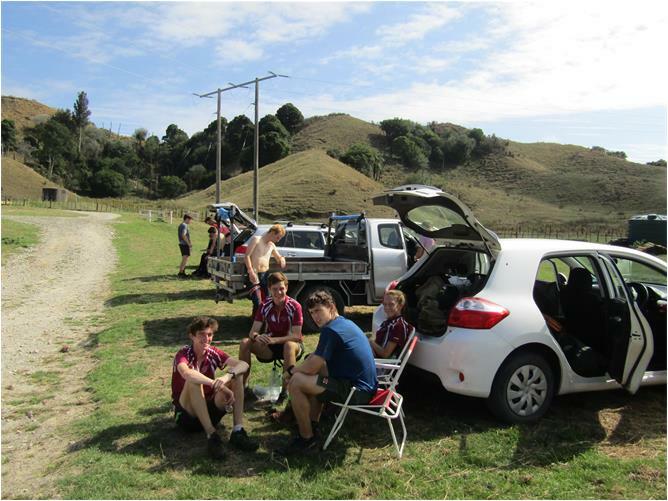 The courses started in the intricate native bush area before crossing Ototoa road into the vague plateau of cutty grass, formline hills and knolls. 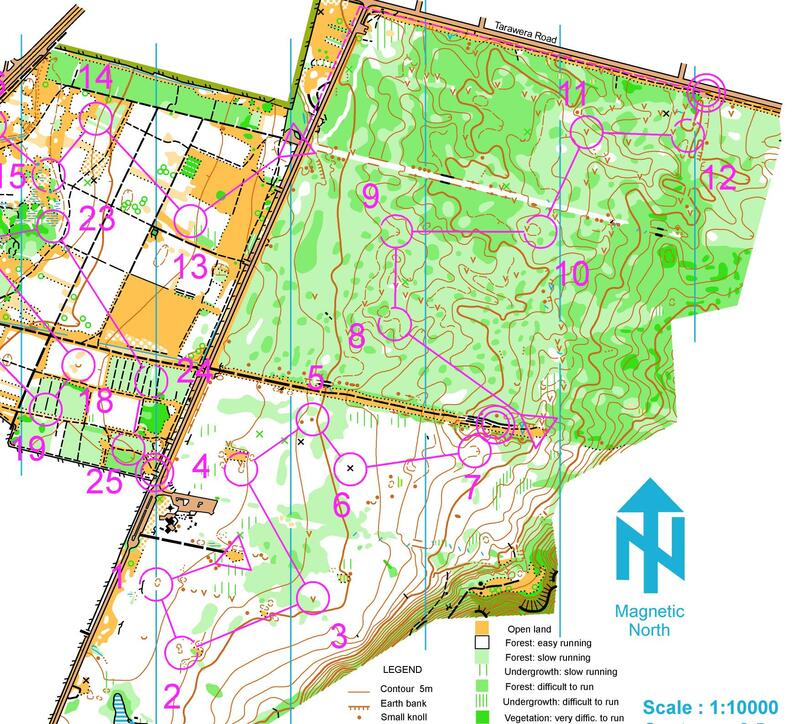 The men’s course then had a massive 2.5 km leg from south to north across the entire map, the women having something somewhat shorter before both courses came into the spectator control by the arena and a final loop back in the native bush. The M20 Course from Rototoa. Given the tough courses it was no real surprise that the older and more experienced in the field came to the fore. Top performers were Briana Steven in the women and Will Tidsell in the men. Briana’s winning margin of over 7 minutes was particularly impressive with Marisol Hunter and Katie Cory-Wright 14 seconds apart in 2nd and 3rd. No-one else was within 10 minutes of Briana’s 1:06:56, although Kaia Joergensen had another impressive run for 4th place meaning that PAPO athletes filled the top 4 places. In the men Will’s margin was around 2 minutesover a closely packed group of Daniel Monckton, Joseph Lynch. And surprise package Liam Stolberger who came in in 2nd place. M20: 1. Will Tidswell (HB) 1:25:17, 2. LiamStolberger (NW) 1:27:11, 3. Daniel Monckton (NW) 1:27:38, 4. Joseph Lynch (PP) 1:27:55, 5. Ryan Williams (AK) 1:29:29, 6. Stephen Harding (PP) 1:29:46, 7. Connor Cleary (PP) 1:31:29, 8. Isaac Egan (PP) 1:33:21, 9. Kurtis Shuker (CM) 1:37:50, 10. Oliver Egan (PP) 1:38:00. W20: 1. Briana Steven (PP) 1:06:56, 2. Marisol Hunter (PP) 1:14:19, 3. Katie Cory-Wright (PP) 1:14:33, 4. Kaia Joergensen (PP) 1:17:14, 5. Tegan Knightbridge (NW) 1:18:24, 6. Georgia Skelton (CM) 1:18:43, 7. Tessa Burns (HB) 1:21:28, 8. Jessica Sewell (NW) 1:21:54, 9. Penelope Salmon (NW) 1:23:52, 10. Anna Duston (AK) 1:27:42. The team for JWOC will be selected after the second round of trials at the ONZ Championships in Oamaru. The elite NOL races were again on the same courses as the trials meaning that the junior eleites also qualify for NOL points in the senior classes. Both Gene Beveridge in M21E, and sister Renee came out on top. Renee was some 2 and half minutes faster than Briana, while Gene was a clear 11 minutes ahead of Will’s time. No other of the elites bettered the winning times in M20 or W20. M21: 1. Gene Beveridge (NW) 1:14:05, 2. Tommy Hayes (AK) 1:26:27, 3. Jonty Oram (AK) 1:33:43, 4. Cameron Tier (NW) 1:38:18. W21: 1. Renee Beveridge (NW) 1:04:57, 2. Imogene Scott (NW) 1;12:17, 3. Alice Tilley (NW) 1:17:09, 4. Lara Molloy (WN) 1:23:40, 5. Heidi Stolberger (NW) 1:26:32. After the weekend there have now been 5 races in the 2019 NOL with 6 more, at Easter and Queen’s Birthday, to come. With the 20’s running different courses to the elites at the South Island Championships there is still not much to yet show how the Senior competition will pan out, but there are significant pointers in the Juniors. In Senior Men, Gene Beveridge is the only person to have run all 5 races and has a commanding lead over Nick Hann, Tommy Hayes and a series of others who have all only run two. In Senior Women the situation is similar with only Lara Molloy having fronted at all 5 races. However, she still lags behind Lizzie Ingham although Imogene Scott has now moved threateningly into 3rd place. Senior Men (no of counting scores in brackets): 1. Gene Beveridge 430 (5), 2. Nick Hann 180 (2), 3. Tommy Hayes 160 (2), 4= Ed Cory-Wright 120 (2), 4=. Conor short 120 (2), 6. Will Tidswell 115 (2), 7. Matt Scott 110 (2), 8. Cameron Tier 108 (2), 9. Tim Wright 106 (3), 10. Jake Hanson 104 (3). Senior Women: 1. Lizzie Ingham 300 (3), 2. Lara Molloy 265 (5), 3. Imogene Scott 240 (3), 4. Sara Prince 190 (3), 5. Renee Beveridge 137 (2), 6. Tessa Ramsden 135 (2), 7. Briana Steven 110 (2), 8. Penelope Salmon 109 (2), 9. Ellie Molloy 97 (2), 10. Tessa Burns 93 (2). In the Juniors, both Joseph Lynch and Tessa Burns have retained their leads following the trials with Will Tidswell moving ahead of Ronan Lee into 2nd place in the Men. Behind Tessa only 16 points covers the next 4 women. Of these only Marisol Hunter in 5th does not have 5 scores counting after mis-pinching in the sprint trial. Junior Men: 1. Joseph Lynch 430 (5), 2. Will Tidswell 310 (5), 3. Ronan Lee 262 (5), 4=. Oliver Egan 186 (5), 4=. Jason Bond 186 95), 6. Isaac Egan 173 (5), 7. Scott Smith 170 (3), 8. Patrick Hayes 159 (5), 9. Tom Harding 143 (5), 10. Connor Cleary 130 (4). Junior Women: 1. Tessa Burns 397 (5), 2. Katie Cory-Wright 281 (5), 3. Briana Steven 275 (5), 4. Kaia Joergensen 270 (5), 5. Marisol Hunter 265 (4), 6. Jessica Sewell 204 (5), 7. Georgia Skelton 178 (5), 8. Anna Duston 177 (5), 9. Penelope Salmon 166 (2), 10. Marina Comeskey 165 (3). The first leg of the pinestars-Bushrangers Test Match will; be at Queen’s Birthday in the Manawatu. 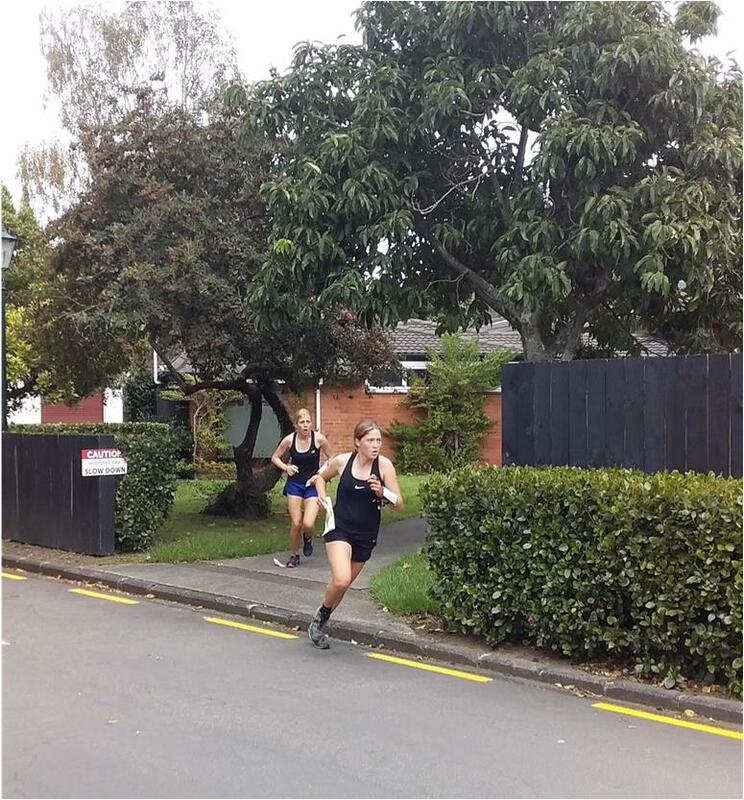 For both Seniors and Juniors this will consist of two forest races (Saturday and Monday) with Sunday dedicated to an individual sprint in the morning and a sprint relay in the afternoon, both in Palmerston North. All those interested in being selected should let Al Cory-Wight (alistaircorywright@gmail.com) know by April 15th. Chris Forne and teammates in Perpetual Guardian cross the finish line at Godzone 8. Outside orienteering the major event of sporting interest for most during March was Episode 8 of Godzone. 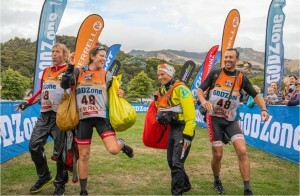 This started and finished in Akaroa and saw the usual strong performances from orienteers led by Chris Forne, whose Perpetual Guardian team crossed the finish line first after 4 days, 8 hours and 30 minutes. Georgia Whitla and Brent Edwards, in Swordfox, were about 5 hours behind in 3rd place, with Tim Farrant and Sara Prince in the 5th placed Torpedo7. Other orienteers in the field whose teams were well up in the field were Tane Cambridge, Nick Hann and Rachel Smith. In 2020 Godzone 9 will move out of the South Island for the first time and will be centered on Rotorua. Overseas Lizzie Ingham was the sole Kiwi at the Meditteranean Open Championships. Held in Malta these consisted of a short middle distance followed by two sprints, the latter being a WRE. After winning the middle Lizzie made a very uncharacteristic error in the first sprint, misreading a tight loop of controls and going from 11 to 14 – a mistake that dropped her to 6th. The final WRE saw her come in 3rd behind top Russian Natalia Gemperle and another Russian. 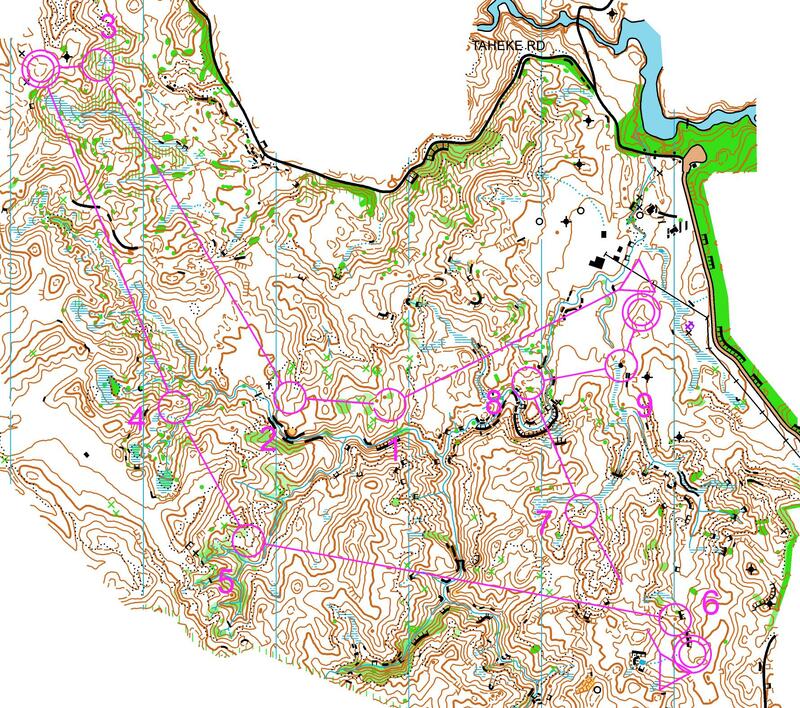 While the JWOC trials were taking place in Auckland, Tim Robertson was racing at the Danish Spring event, held on the same areas as last year’s World Masters Championships. Not having entered the sprint, Tim’s best result was in the long distance where he finished an excellent 8th just under 10 minutes behind winner Vojtech Krak of the Czech Republic. In the previous day’s middle distance after being in 7th place after 11 controls a series of small errors saw tim drop to 37th. DFSNZ really does find orienteering! I reported last month that Drug Free Sport NZ had requested details of all our top HP athletes. I finished the short paragraph by saying “…It will be interesting to see if, and when, any testing takes place…” I can now report that at least one HP orienteer has been visited, at home, at 9pm in the evening, and been required to provide a sample! 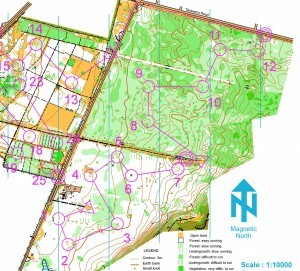 This will be the first ever out of competition test undergone by a NZL orienteer!